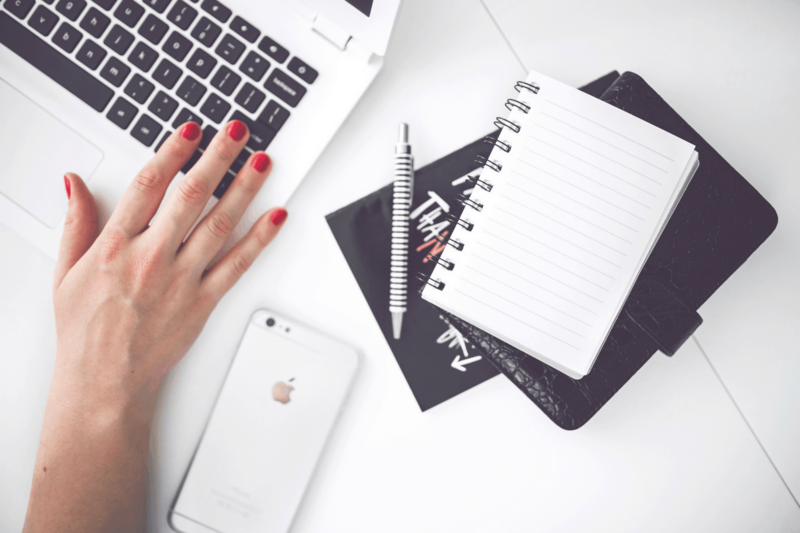 Are you getting ready to start a blog? 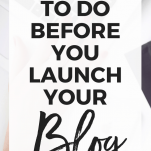 There’s definitely a LOT to learn and prepare for before you launch your blog, and it can be super overwhelming. I remember when I started my blog, it was on a bit of a whim. I was not at ALL prepared. But I figured out pretty quickly that I had a LOT to learn. I want to help you out by sharing a few things I definitely wish I had known before I started my blog. 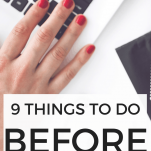 Before you launch your blog, you’re definitely going to want to do these 9 things! A lot of times people go into blogging already knowing what they want to blog about. If this is you, awesome! You can totally skip this step. If you want to start a blog but aren’t sure what to blog about, then this one is for you. First of all, think of things you’re interested in and enjoy talking about. Like, REALLY enjoy talking about. This is a subject that you might be writing about for years, so you’d better really enjoy it! Next, think about things you’re good at. If you’re lucky, this will intersect with things you’re interested about and you’ll have some blog topics ready to go! Finally, what are OTHER people interested? If you have a super unique interest that no one else blogs about, that might be a sign that there just isn’t a market for that topic and you aren’t going to get any readers. I know a lot of people are hesitant to start blogs in niches that are already pretty saturated, like fashion. But just remember, that just means there’s money to be made in that niche! When you first get ready to start your blog and aren’t super familiar with blogging yet, it can be a little overwhelming to have to make decisions such as what hosting company to choose. There are SO many to choose from and you’ll get a lot of conflicting information on different blogs. I have used two different hosting companies on my blog so far. The first I chose because it seemed that the majority of bloggers were recommending it, and I ended up being really unhappy with it. Then a couple of years ago, I switched to SiteGround. I am a HUGE fan of SiteGround. My site has not gone down a single time, their customer service is AMAZING, and their prices are comparable to other popular hosting companies. Click here to sign up for SiteGround for just $3.95/month! For many people getting ready to start a blog for the first time, choosing their blog name seems to be one of the biggest hurdles. I’m going to let you in on a little secret. It doesn’t matter that much. It matters some, but not a lot. Yes, it’s great if you can find a name that’s really memorable or catchy. But I don’t think the name has much relevance at all as far as how much traffic you get. When it comes to choosing a domain name, I recommend following a few ground rules. First of all, choose something that is easy to remember and easy to spell. If you tell someone the name of your blog, they should be able to look it up easily. It can also help to have a name related to your blog niche, but be careful not to make your name TOO specific. You’re really boxing yourself in that way and if you want to expand your blog topics, you may have to change your blog name. At the end of the day, when all else fails, you can always just name your blog after yourself – honestly, a lot of people do this! Even if you don’t start posting on them right away (though it certainly wouldn’t hurt to start posting on them right away) you want to get your handles reserved on every social platform so they aren’t taken. You definitely want your social media handles to all match, and ideally, they should be either your name or the same as your blog domain. So even if you don’t think you’ll be using Twitter for a while, go ahead and snag the handle with your blog name so when you DO want to use Twitter, it hasn’t been grabbed up by someone else. For those who aren’t as tech-savvy, getting your site actually set up can definitely be pretty overwhelming for people. I can totally relate! When I first started my blog, I had ZERO website or coding experience. It was definitely a learning experience. There are a LOT of blog themes to choose from online, but I managed to find one that has a very little learning curve. After experimenting with a few that didn’t quite work for me, the theme I’m using now is the Divi Theme from Elegant Themes. And I seriously kick myself for not discovering it earlier! It’s has a drag and drop visual editor, which makes it SO easy to get your pages set up without any coding. I mean it – Divi Theme is where it’s at! So let me preface this by saying that when I started my blog, I didn’t have anything even resembling a blog business plan, and I actually didn’t even know you could make a business out of your blog. But if you want to make money blogging, a business plan is definitely something you’ll want. When you’re first starting out, you definitely don’t have to get too detailed. I promise it will change a LOT as you go. But at the very least I would recommend laying out the type of content you’ll share, your content strategy (which platforms will you be active on? ), and the basics of how you plan to make money blogging. If you’ve been researching starting a blog, then you’ve definitely read before that the money is in the list. This seriously could not be truer! A solid email list is by far the best way I know to monetize a blog, so you’ll want to start giving even your first few visitors the opportunity to sign up for your list. So how do you get people to sign up for an email list without a blog? I recommend creating a freebie or email-opt in, promoting it on social media, and directing people to a landing page for your email list. They’ll give you their email address, you’ll give them a freebie (maybe a small eBook or checklist), and they’ll be on your list! There are just a few really reputable email service providers for bloggers. One more affordable options would be MailChimp or MailerLite (both free for your first 1,000 subscribers. The provider I use is ConvertKit. It’s a bit more expensive, with plans starting at $29/month, but it’s also a lot more powerful than MailChimp or MailerLite. I launched my blog with zero posts. But like I said, I also had no plan whatsoever and didn’t even know you could make money blogging! When you get ready to start your new blog, I recommend pre-writing some content so as your first visitors trickle in, they have at least a few posts to read. Pre-writing content also allows you to get out some of the kinks early on because you’ll get some extra practice in right away. If I had started with a handful of posts already on my blog, I probably would have been able to grow my blog traffic a LOT faster. It is definitely never too early to start networking with other bloggers! There are SO many Facebooks groups that exist purely for bloggers to offer each other support and ask questions. Consider joining a few of these and introducing yourself. Then you can start getting some of your blogging questions answered before you even have your blog up and running, and you’ll already have some blogging friends. Not only do blogging friends provide great emotional support (other people in your life may not understand what it is you do as a blogger), but they’ll also be able to offer advice on your blog, and maybe a potential collaboration partner down the road. Have you launched your blog? Leave a comment and let me know! 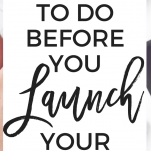 If you haven’t yet, you’re definitely going to want to do these things BEFORE you launch your blog. You got this!